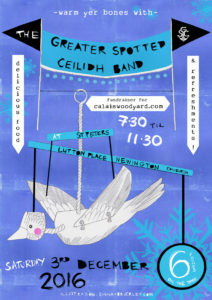 We in the band had the most cracking night at the ceilidh at St Peter’s last Saturday. It was really exciting and heart warming to see all those vibrant people whirling, such generous and beautiful energy is hope in dark times. 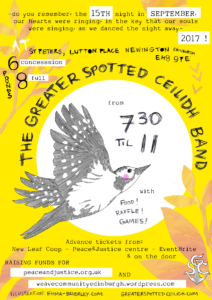 It was probably the best turn out we have had since the first Greater Spotted Ceilidh we put on back in 2013 (can you believe it?!) and for some of us at least it was the most fun we have had playing a ceilidh in a while. The amazing team of volunteers who staffed the door, the bar, put out decoration, went on a mission to get extra supplies when we ran low, performed a host of other invaluable feats, and generally exuded supportive and grounding vibes. Darla and Emma for creating the delicious ‘Kaleidh Soup’ and to Womtopia flat for offering the use of their kitchen for this. The mighty Forest Cafe for lending us their PA system and to Tibo for so generously giving his time to do the sound. Emma Brierley for creating yet another beautiful poster/ flier design and Edinburgh Uni print services for being really friendly, helpful and offering great prices on printing. Sorry if you should have been mentioned here but haven’t, so many folk helped out that it’s hard to keep track of. We intend to make the public ceilidhs a more or less quarterly happening (in an imprecise kind of way) and are looking at some time in February for the next one. Keep an eye on the website for details. It’s been a good while since we put on a ceilidh and we’re hoping to make it a special one, as always there shall be refreshments on offer and this time there’ll be delicious home-cooked vittles as well. We celebrate the entry of the Greater Spotted website into the world. Designed by the ingenious Cyber-engineer Doug Brown, it features the inspired work of artist Emma Brierley who has so generously created the posters for our Edinburgh events over the past few years. We’ll keep the site updated with any public performances we’ll be doing including the next Greater Spotted Ceilidh scheduled for the Autumn. It wouldn’t be altogether surprising to see the plumes flocking to the Meadows this August for some outdoor Summer sunshine capering as well. We’ll be sure to post news of any spontaneous happenings.